Protesters from the Rising Up group caused tailbacks on the M4 heading towards Heathrow airport, in their latest action against plans to build a third runway. A video posted by the group shortly before 8.30am shows a car blocking the Heathrow Tunnel that accesses Terminals 2 and 3. 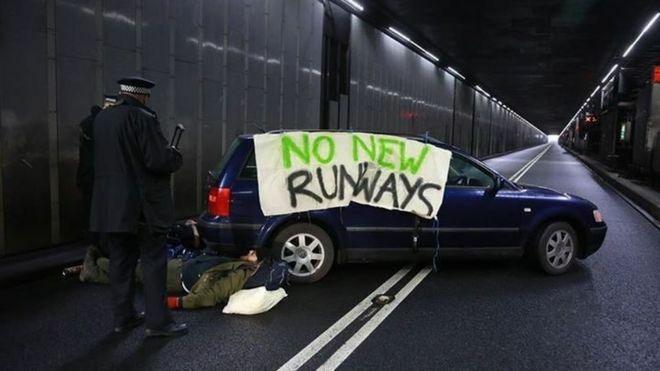 They draped a sign reading ‘No new runways’ over the car, and there was an activist lying next to the vehicle, locked to it, on the road. The Met police said officers attended the scene at 8.25am and arrested two people for obstructing a highway. The police said five people were arrested. Three protesters were locked to one of the vehicles and two were drivers of two cars. The tunnel was closed for over two hours, and the M4 spur road was also temporarily closed, while police worked with Heathrow Airport staff to remove the people locked to the third car. A contra-flow was put in place in the outbound tunnel to facilitate the movement of traffic around the blocked tunnel. There were delays in surrounding roads. Transport for London said just after 11am the tunnel re-opened. The protest follows a flashmob the group held at Heathrow on the weekend. The main approach tunnel to Heathrow Airport was blocked by protesters objecting to plans for a third runway. Three cars were parked across the road, with protesters chaining themselves to one of the vehicles at about 08:30 GMT. The tunnel, which accesses Terminals 2 and 3, was shut for more than two hours while the M4 spur road was also temporarily closed. Five people have been arrested on suspicion of obstructing a highway, the Metropolitan Police said. One of the protesters who was chained to the vehicle was taken to hospital as a precaution. The disruption caused widespread delays, as traffic was diverted to the outbound tunnel at the airport. A spokesman for the Rising Up campaign group said it was protesting against the impact a proposed third runway could have on climate change and the local area. Campaign group Back Heathrow said the actions of the protesters were “selfish, short-sighted and counter-productive”. A four-month public consultation into the decision to build a third runway at Heathrow is under way. Rising Up, which staged a similar protest last November, says if the runway goes ahead it will allow an extra 250,000 flights a year, causing carbon dioxide emissions equivalent to the whole of Kenya’s. Simon Bramwell, one of the activists involved in Tuesday’s action, said in a statement released by Rising Up that he also participated in the previous protest. The main road entrance tunnel to Heathrow’s Terminals 1 and 2 was blocked by climate change activists from Plane Stupid, for about 3 hours, from 7.40 this morning. Three activists parked a vehicle across both lanes of the entrance tunnel and locked themselves to it, unfurling a banner quoting David Cameron’s election promise in 2010: “No Ifs, No Buts: No Third Runway”. Five people were arrested, and the tunnel was finally cleared and the road re-opened by 1.30pm Some travellers may have been delayed or could have missed flights. Local resident Neil Keveren, a builder from Harmondsworth, whose house would be bulldozed for the 3rd runway, was fined after blocking the same tunnel with his van for half an hour on 2nd July, the day after the Airports Commission announcement. Neil said: “No one wants to do this. They feel they have to. People feel they have no choice. After we campaigned for years, David Cameron was elected promising ‘no ifs, no buts: no third runway’. …. We have tried every other option. We have been forced to be disobedient just to be heard. To save our homes and our planet.” There is already airport capacity for families taking a couple of trips per year, or wealthy foreign visitors to the UK, but a new runway would be for the most wealthy to take multiple leisure trips each year. Plane Stupid apologised for causing inconvenience, but believe the strong arguments against a Heathrow runway must be heard. A blockade of Heathrow’s road access tunnel to Terminals 2 and 3 brought traffic to a halt for more than half an hour at 12.45pm today. The protest follows yesterday’s announcement that the Airports Commission report recommends the building of 3rd runway at Heathrow. This would require the destruction of over 1,000 homes in Harmondsworth, Longford and Sipson with a further 3,000 homes made uninhabitable due to excessive noise and pollution. Neil Keveren, a Harmondsworth resident, used a large white van to block both lanes to incoming traffic. He then unfurled a banner that covered the side of his vehicle to face the stationary traffic saying, “Residents Against Expansion – No ifs, no buts, no third runway”. The banner refers to David Cameron’s pledge prior to the 2010 election. His entirely peaceful protest was only ever intended to last 20 minutes, to avoid disruption to the airport. His co-operation enabled the police to avoid an evacuation procedure that would have caused further disruption to traffic. Neil Keveren made it clear his action was a personal protest, and was not part of his role as Chair of the Stop Heathrow Expansion (SHE) campaign group. However, his action were supported by many local residents and the local MP, John McDonnell. Posted: Tuesday, February 21st, 2017. Filed in News about Airports, Publicity & Politics, Recent News.